Here in the Ozarks, folks love America, and no where is that sentiment more evident than in Branson. Not only do many of its most popular attractions, including Silver Dollar City and many famous music and comedy shows, celebrate and embrace true Americana, but Branson really knows how to throw a patriotic party. Each Independence Day, countless celebrations occur on the famous Branson strip as well as along the area’s three scenic lakes. Locals and visitors gather en mass to enjoy plenty of July 4 fun at barbecues, concerts, patriotic shows and fireworks extravaganzas. The patriotism holds strong all year, with plenty more American celebrations on Memorial Day and Veteran’s Day. A large part of Branson’s Americana can be found in its traditional Ozarks arts and crafts, found throughout the Live Music Capital of the World. Branson may be best known for its live music and entertainment, but it’s also home to an abundance of museums and art galleries. For as long as people have settled in the Ozarks, artists have found inspiration in its scenic hills, waterways and natural wonders. Visitors who’d like to take in a broad array of Americana created by actual Ozarks’ artisans can do so at their own pace while browsing through the Branson Craft Mall. Looking for a unique American gift? You’ll find it at the Branson Craft Mall and its 16,000 square feet of artisans, their wares and plenty of hillbilly fun. From hand-painted home goods and holiday décor to iron works and candles, the Branson Craft Mall truly has it all. Patrons are sure to find the perfect souvenir or unique American gifts, including many made by Ozarks crafters. The Branson Craft Mall isn’t just a shopping experience, however. Visitors can witness creation first hand while viewing working craftsmen do what they do best. Artisans include basket weavers, silversmiths, potters, engravers and carvers, as well as clothing, bead and stained-glass artists who not only create wares sold at the craft mall, but even take custom orders and sometimes give classes so others can learn the tricks of the trades. The crafters at Branson Craft Mall range from soap makers to silversmiths, and everything in between. Watch carver James P. Spizewski as he carves and burns designs into walking sticks, wooden saw blades, magnets and birdhouses, then purchase one of his specialty, hand-painted rocks. Later, choose form the wares of Master Craftsman Les Seamster, who uses high-speed dental tools to engrave powder-coated brass plates. Other Ozarks artists at Branson Craft Mall include Kirk and Mary Lou Powell, who have been creating stained glass in Branson for more than 27 years, and weaver Marty Bartlett, who took her first basket-weaving class 23 years ago and was immediately hooked. Looking for ways to showcase your patriotic spirit? Plenty of the Branson Craft Mall’s 200 booths of arts and crafts feature flags and banners that celebrate America and plenty of red, white and blue. Or maybe you’re in search of the perfect American outfit to wear to that special Memorial Day or July 4 celebration. Head of to Dazzle Me Designs, where designer Stephanie Pearman makes appliqued shirts with matching tank tops, Rhinestone-adorned knit tops and jackets, as well as the largest selection of “Popcorn” shirts in Branson. 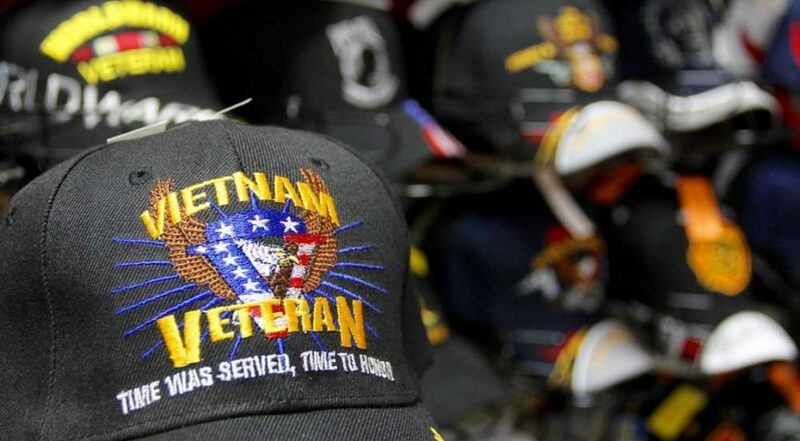 Perhaps you’re in the market for a custom one-of-a-kind gift for your favorite veteran. You’ll find it at Sho Me Silver, where silversmith Arlen Evins does all the stone and silver work for a host of unique pieces right from the Branson Craft Mall. Evins’ love for stones began back when he was a kid, on a farm right in the Ozarks. That love has resulted in skillful stonework and silversmithing that are transformed into works of art. Located on Highway 165, just a hop, skip and a jump south of Branson’s famous 76 Country Boulevard, the Branson Craft Mall is open 7 days a week from 8 a.m. to 8 p.m. and welcomes motorcoaches into its ample parking lot.